Magnus Carlsen leads with two rounds to go. | Photo: Shamkir Chess. Magnus Carlsen is back to being the sole leader at the Gashimov Memorial in Shamkir, Azerbaijan. 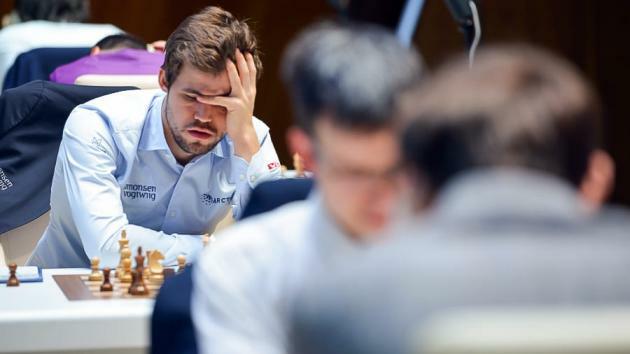 The world champion defeated Anish Giri today while the other four games ended in draws. In the Game of the Day (especially in terms of results!) Carlsen defeated Giri convincingly, even though the computer showed at least one quicker win. In what looked like a rather innocuous English Opening, Carlsen found a plan that still brought him some play. Carlsen: Usually when there are no knights on the board it's very dry and it's nothing for White..."
Giri: "That's what I also thought." Carlsen: ..."but in this case I feel like I'm getting some quick play and at least practically it feels easier to play." A convincing win for Carlsen vs Giri. | Photo: Shamkir Chess. The plan involved the f2-f4 break, where Giri expected the d3-d4 one instead. The Dutchman regretted removing his bishop from the g1-a7 diagonal, and also that he didn't play ...f7-f5. Carlsen sacrificed a pawn but got his f-pawn to the fifth rank, strong bishops, an active queen and an open g-file. All this was just too much, and his attack was quickly winning. Instead of going for a killer blow, Carlsen went for an endgame instead (admitting it was "extremely prosaic") but helped by Giri's time trouble he won that easily anyway. The Carlsen-Giri press conference. | Photo: Shamkir Chess. Shakhriyar Mamedyarov vs Ding Liren was a rather quiet game for a long time, until all pieces left the board and we got a pawn endgame. With three breakthrough pawn sacrifices in a row (actually four, if we include Black's), Mamedyarov got himself a passed pawn but so did Ding and eventually the queen endgame was a draw. Very nice! An interesting pawn endgame in Mamedyarov vs Ding Liren. | Photo: Shamkir Chess. Teimour Radjabov played the Scotch against Veselin Topalov and it became the Mieses variation. Black's king was forced to d8 early in the game, but it didn't really matter (and it was theory!) as the queens left the board early. Black was always OK.
Radjabov vs Topalov. | Photo: Shamkir Chess. David Navara and Sergey Karjakin drew an English/Catalan game where the whole queenside got traded off in a long and seemingly forced variation. Round 7 in action. | Photo: Shamkir Chess. Alexander Grischuk held Vishy Anand to a draw in an Anti-Berlin, where the players followed a game Giri-Sethuraman from the 2018 Chess.com Isle of Man Tournament for 15 moves. With a temporary pawn sacrifice Black held the balance here. Clever play from Grischuk today. | Photo: Shamkir Chess.